On our way to Sault Ste. Marie we passed by a few interesting looking towns -Espanola, Blind River, Iron Bridge, Bruce Mines etc. Most of these towns were small and primarily mining towns. They had this slightly old, rustic look submerged into endless greenery, a combination that would instantly attract an adventurous mind. However, we weren't looking for adventure. The only thing that went on my mind was to get to Sault Ste. Marie, drop Mili and Zakeem in the apartment and get to work. That was the most important part – GET TO WORK. We tried not to even stop unless absolutely necessary, which was obviously nature related. The drive was painfully slow as the small towns each had there own speed limit ranging from 40 kilometers to 80 kilometers per hour. From my experiences living in USA I knew small town sheriffs and deputies were more likely to lay a speed trap than their counterparts in the city zone. The last thing I wanted was a speeding ticket something that could cost me in access of 100 dollars. Nevertheless, the often slow drive through the curvy, mostly lonely but spectacular road was something that we fell in love in later days. Our apartment complex was right at the mouth of the town, just past the large signboard that welcomed visitors into the decaying town proudly declaring it as the home town of Dr. Roberta Bander, the first female Canadian astronaut and world's first neurologist in space who spent 8 days in the orbit on the space shuttle Discovery in 1992. The city also had another unique distinction. It was the only city that had parts both in USA and Canada. The part in the Canadian side was much larger and more populated with about 80000 people in comparison to 18000 across St. Marys River - a tributary of Lake Superior, world's largest freshwater lake by surface area and third largest in water volume. Once a bustling city with Algoma steel Inc. (currently Esser Steel Algoma), Canada's biggest steel company, as the largest employer with more than 5000 employees, the city has gone through tough times in recent years. The steel company was still the largest employer but struggled to survive against tough competition. Call centers, Sault hospitals and Ontario lottery was the next three largest employers. 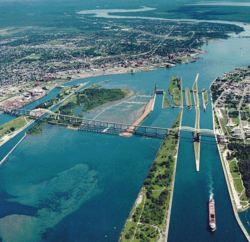 Another distinction of the city was the Soo locks that allowed the shipping traffic in the Great Lakes system to bypass Saint Mary's Rapids, the world's busiest canal in terms of tonnage that passes through it. Watching the large ships slowly and steadily slipping through the canal, we later found, was a very interesting view. The Soo locks were located below the almost 3 mile long truss arch bridge with suspended deck that connected Sault Ontario with Sault Michigan (Canada-USA), something that presented another spectacular view against the blue sky and the ever rushing rapids dotted with large, dark boulders and plenty of fishing activities.